One hundred fifty pastors, elders, and leaders from Henan Province’s China Gospel Fellowship – a network of house churches and one of the most significant evangelical Christian movements in China – planned to hold a year-end gathering. The Chinese Communist Party (CCP) had the Fellowship under surveillance and intercepted their plans. In a dramatic raid, all 150 pastors were arrested on the morning of January 15, when their meeting had barely begun. According to a source, the pastors had been under surveillance for an extended period, and the authorities learned of the planned meeting well in advance. The case was designated as “Mega-Case 115,” and Henan authorities were ordered to prepare a mass arrest operation. Immediately, the cellphones of all the pastors were placed under surveillance. The pastors and elders from Henan’s Nanyang city (including the counties of Tanghe, Tongbai, and Xinye) gathered at Haoyue Hotel to have their year-end meal together. According to eyewitnesses, at just past 10 o’clock in the morning, the deputy minister of Henan Province’s United Front Work Department (UFWD), accompanied by more than 150 special police officers showed up at the hotel. Some of them stood in three rows to block the path in front of the hotel’s entrance, and the others stormed into the hotel. 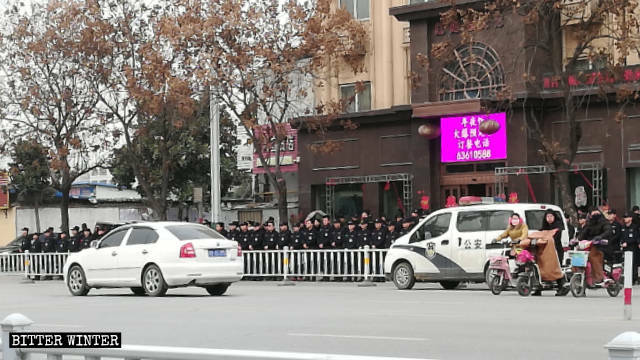 Special police officers standing in three rows to block the entrance in front of Haoyue Hotel. The cellphones of all 150 pastors were confiscated. During the raid, one pastor collapsed as he suffered a heart attack. He was placed quickly into an ambulance and taken away. The personal information of all the remaining pastors was registered. Afterward, each of them was taken to the police station in the municipality of their registered residence. Each was threatened to sign a “statement of repentance” before they were released. 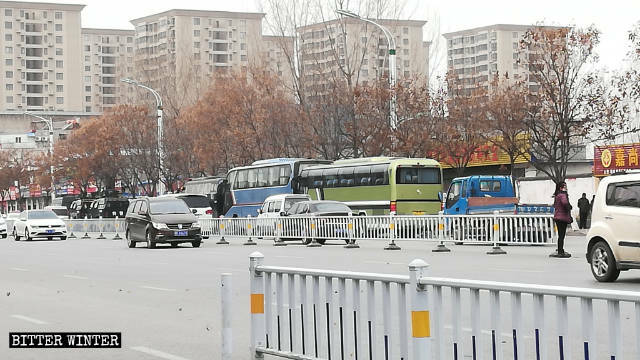 Special police cars and two large buses stopped outside Haoyue Hotel. According to one local believer, all of the pastors were released the next day, but their phones and vehicles were all placed under surveillance. One preacher was singled out for extra observation: a surveillance camera was installed in front of her house. This 24-hour visual surveillance increases the pressure she feels, and discourages her from going out to preach. She has also been required to report to the police station every day. The authorities returned to Haoyue Hotel the next day and warned the hotel staff to be discreet and don’t tell anyone about the pastors’ arrest.